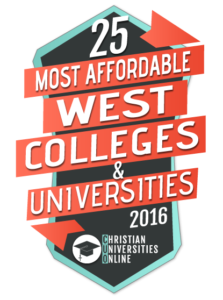 Hope International University has been ranked in the top 25 Most Affordable Christian Colleges & Universities in the West by Christian Universities Online, the trusted guide to Christian colleges and universities. Hope offers financial aid to students in a variety of different forms, including scholarships, grants, work study programs, or student loans. 99% of HIU’s beginning full-time undergraduates receive some type of financial aid. The methodology behind this ranking began with schools that are members or member eligible of the Council for Christian Colleges and Universities (CCCU) and geographically are in CUO’s West region of the United States. Schools were then ranked according to publicly available “net price” tuition data. Total cost of attendance is the sum of published tuition and required fees, books and supplies, and the weighted average for room and board and other expenses,” by the National Center for Education Statistics (NCES). College tuition and costs can be a great burden to families. While total cost is not necessarily the primary measure of a school’s value and quality, it is a valid and important consideration. For more information on HIU’s financial aid, click here.